The growth of algae, slimes and pathogens is accelerated in nutrient solutions that are exposed to light. Further, some brands of chelated trace elements can decompose when exposed to UV light. This causes them to become unavailable for root up-take. Light exposure can be minimized by placing a lid on the nutrient reservoir. Also, cover other regions of the system where nutrient is exposed to direct light. For example, the top of open trays and channels. 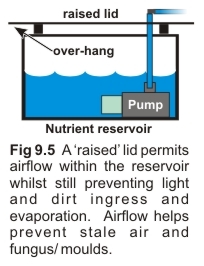 When placing a lid on the reservoir, have it in a raised position so that air can freely enter and exit (Fig 9.5).